It took a lot of tries, but I hit the target in Japanese archery. I hit the target. That’s not some metaphor, either. I mean I hit the target. It took a few dozen tries, and plenty of help from the archery master, but I hit the target with one arrow. Success. Tsubaki Grand Shrine, where I am spending two weeks as part of a study program for Unitarian Universalist seminarians, installed an archery range last year. That might not seem like an obvious thing to do, but for the Shinto religion, it is. All the martial arts are seen as part of practicing one’s faith. They are spiritual practices, and the people here certainly treat them as such. At the archery range, it isn’t just show up and start shooting. There’s proper clothing to wear (which I am obviously not doing in this picture, but they made an exception for me – probably because I’m a Westerner, and thus not expected to do everything right). There’s a proper way to approach the range, the proper way to bow, a proper way to hold the bow and the arrows, a proper way to put the arrow on the string, a proper way to take aim and pull the string back, a proper way to release, and a proper way to walk away from the range afterwards. Tea is the same way. 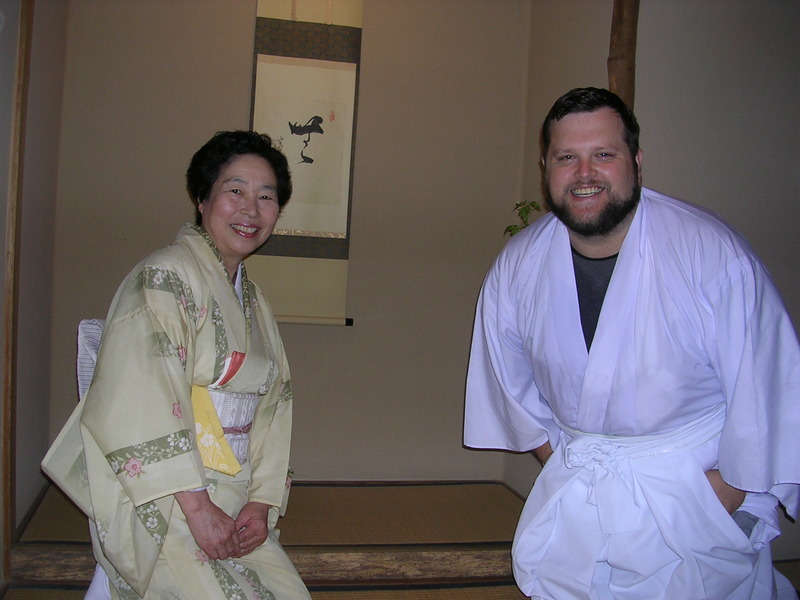 Today I did a traditional tea ceremony, led by Akiko Niki, one of the women who runs the tea house here. You enter, take off your shoes, put on slippers, walk across the room, take off the slippers, and sit down on the bamboo mats (I wore the slippers at the wrong place). She brings a sweet of some sort – mine was a sweetcake, something like a thick slice of brown and blue jello – and puts it before you in the proper way. You eat that while she prepares the tea. She brings the green tea, which isn’t like the tea we have in America. It’s thicker and has more flavor, more of a brothy taste. It’s closer to soup in some ways than a drink. Everything here is done in a certain manner, and it’s all important. I’m reminded of that old adage about the Army. There are three ways to do things: the right way, the wrong way, and the Army way. Here, it’s the Shinto way (which is redundant, since “Shinto” means “way of the kami (deity)” – the first kanji (Japanese script) can be pronounced either “shin” or “kami” and “do” means “way”). The Shinto way is a right way, but it’s also very particular, often rather difficult, and has been done this way for many centuries. This doesn’t come naturally to me. I have always done things my own way, found my own way to get results. But here, hitting the target is only part of it. The way you hit the target matters, too. And that’s been in my mind the last few days. The archery master, Yoshio Shimura, reminds me a lot of my grandfather, who was a woodworker and patternmaker. Both men know what they’re doing, and like working with their hands. They even, if I can say so, have some physical resemblance in the face. And both of them have the same manner of instructing. They tell you what to do, move your body around to make it right, let you fail, step in when they think you need it, and have a way of making you do better. Japanese archery, or kyudo, is different than Western archery. 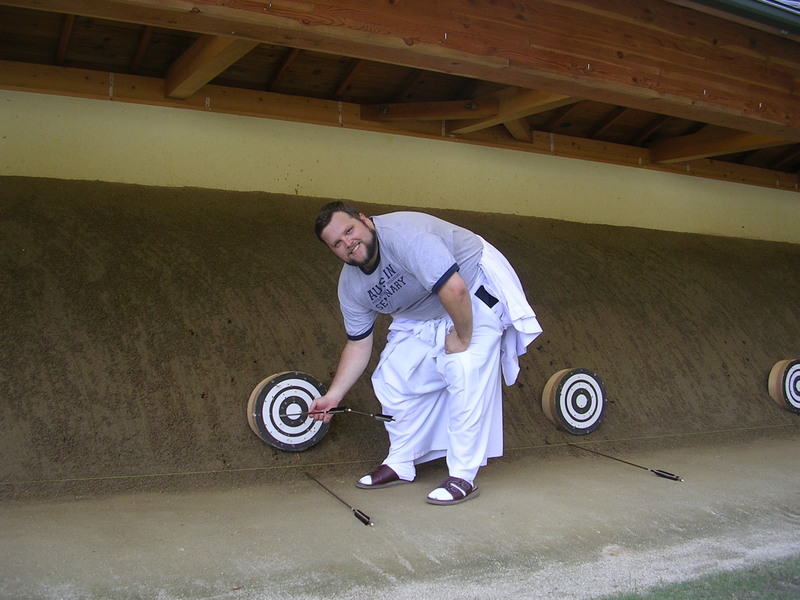 The bows are more than seven feet long, and the technique is different. You don’t pull the string back to your cheek, but instead well behind your head. And the arrow is held more by your thumb than your fingers, using a special leather glove. It took me two days, several dozen arrows, and a lot of help from Shimura-san, but I hit the target, which is about one foot wide and about 75 feet away from the shooting point. Apparently, that’s better than most of his Japanese students do. I hope to have a chance to do more. Akiko Niki and myself at the shrine's tea house, after the tea ceremony. At the tea house, Akiko Niki has a special way about her, too. After the ceremony, I ask if she can show me around. She first shows me the traditional room, which is smaller (and has very low ceilings and doors) than the main room they use. The door to the outside is about two feet tall and two feet wide. Traditionally, this was to keep samurai from bringing weapons into the tea house, I was told. You can’t fit through that wearing a sword. She then showed me the kitchen, which is very simple. A sink built into the floor, a hot plate (even traditionalists are using technology these days) to keep hot water, and shelves for the plates and bowls. The tea, which is grown locally, is mixed by hand from a green powder. She let me mix one, using a bamboo whisk to thoroughly mix it, which leaves a green froth on top. The hot liquid is surprisingly filling. I’m here to learn many things. Today’s lesson, I think, is about the Shinto way. Tomorrow will be different, as we take a trip to visit Ise Grand Shrine, perhaps the largest and most prestigious Shinto shrine. Having looked at your link, yes, I think it was. Here they just called it green tea, but I didn’t think to ask for the Japanese word.